I spent a majority of yesterday’s work day listening to Band of Skulls after seeing their name on the 2012 Lollapalooza lineup. Out of that big, long list, why was I attracted to a group with such a morbid name? Because it sounded familiar. Do I know why? No, not a clue. Generally, I try to avoid anything with the word skulls, crossbones, arsenic or Vanessa Hudgens but not on April 11. All bets are off. Prepare yourself for a little story I like to call musical fate. After my discovery yesterday, I blabbed about Band of Skulls for awhile. I told my co-workers about them, I sent a text to my cousin and I rambled to my manfriend about how they had an alternative sound but a pretty rock heavy sound from the guitar (he thinks I like weird things). I also decided I would feature a song by them for song of the day the following day. Band of Skulls, you’re welcome for the word of mouth marketing. As I stumbled into work today, I couldn’t help but notice that my desk looked like a band of tornadoes had gone through it. I tried to make myself feel better by moving some post its around and discovered this gem. 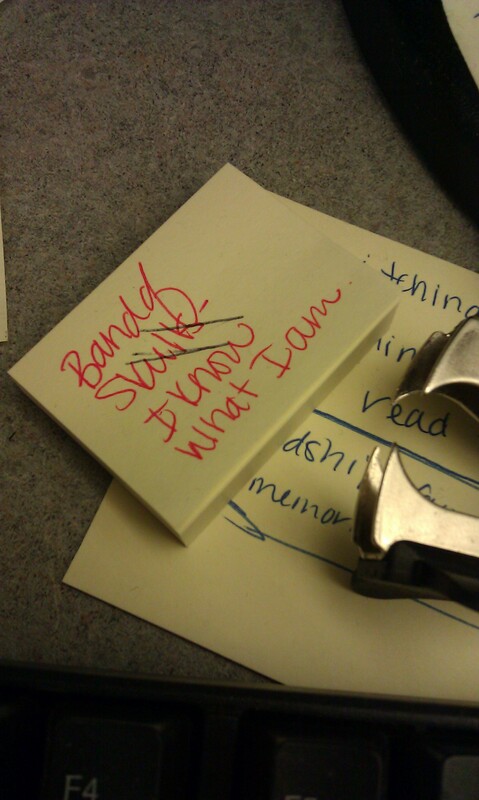 In case you’re struggling to read my red pen scrawl, it says: Band of Skulls – I Know What I am. It’s true. Please tell me you now understand why I called this musical fate. While it may also prove why I recognized the name, I’m not sure how long ago I wrote this down or what prompted me to, aside from the sheer fact that it’s a great song. A wonderful story like this constitutes two songs for today. Plus, The Devil Takes Care of His Own proves that the guitar portions are extremely rock driven. Oh, and in case you’re wondering, my desk is still Disastville U.S.A. Things you might notice upon first glance include a small tailgate table, multiple post its and a my little pony toy from a McDonald’s Happy Meal. Tags: Band of Skulls, I Know What I Am, Lollapalooza, Lollapalooza 2012, Music, The Devil Makes His Own. Bookmark the permalink.